Join the discussion on our forums! Come discuss Revenge of the Wild over in our dedicated Revenge of the Wild discussion topic. Summon your Beasts that died this turn. My roommates only use Revenge of the Passive Aggressive. Lol noobs think this card is good. Stop dreaming about crazy combo's and reviving 7 king crushes in a single turn, no need for that. Just play Greater Emerald Spellstone on turn 5 > trade then revive all of them for just 2 mana on turn 6 > You win the game on the spot. This card is crazy good. Midrange, aggro, and spell hunter can all use this card very effectively. I’m expecting to see a lot more hunters on the ladder with this expansion. I missread it. U though all beasts that died this game. That would be insane. To anyone who thinks it's just a win more card - are you insane? it's a super high power level card that gets you value even when you have very little on board. aside from the really memey ones, here are a few scenarios you could pull off reliably. b) throw it into midrange Hunter with a bunch of beasts and use it whenver you can or need to trade your board away. Getting a Savannah Highmane out of it is great, but even just a Bearshark and a Dire Mole are value in a deck that needs to keep the pressure on. c) use it in Big/DR Hunter with something like Charged Devilsaur or King Krush from Kathrena for a trade and a extra face damage (or extra trading). Bonus points if you got one of them to stick for a turn and multiply them with Cube or through other means. e) attempt to actually build a deck around it and fail because Hunter still can't play combo. I don't think your revived beasts will be Dire Frenzied like originals were. Flark's Boom-Zooka+Revenge of the Wild OP! Can't wait to try this out! Pint-Size Potion for Hunter, might be better in some cases. this is my favorite card! 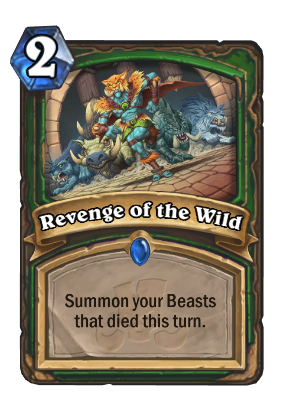 I am sure this card will be nerfed in the near future as this card is too good..
Hunter is a class that naturally put a lot of pressure on the board, trading minions here and there, and then this card gets printed. Just resurrecting a Bearshark or other well-statted 3 mana beast will be profitable for your mana already. And this can resurrect any beast and every beast that died this turn. Imagine a Savannah Highmane and Misha on board and you cast Unleash the Hounds. Trade your minions, cast this, and get back your full health 6/5 lion and your 4/4 taunt, along with 3-4 charging 1/1 hounds. For 2 mana. The only restriction is that you have to trade your beasts to make them die, which will not be a problem if you are going to bring them back to full health anyway. This card is even more insane than Defile. Probrably every hunter will use this, even in spell hunter just resurrecting an Animal Companion, or other tokens, is good enough. When this gets into the game, two things can happen. One is that this card somehow isn't that overwhelmingly good, in which case shame on us, or more likely, that the card will be see play in hunter everywhere, in which case I will wonder how does Blizzard let a card like this pass through the testing phase, like, they hire real game designers. You are dreaming. This is a combo card. Hunters cannot draw quickly so this situational card will likely never be in your hand when you need it. Bad card. Really powerful with minions that have rush or deathrattles. I love this card, I can't wait to try it out in my Big Hunter and deathrattle Hunter decks. One deck, 27 spells, three minions, two Charged Devilsaurs and Krush, two of this and Flark's Boom-Zooka.